Improved medical care has enabled more and more elderly to live far longer than possible in the past. This increasing number of elderly do, however, need some sort of assistance because of their diminishing ability to manage the tasks of daily living without help. Volunteers are a growing source of that help. The Washington Square Health Foundation recognized the need for tested training and management methods to assure the efficient and cost-effective use of volunteers. A grant from the Washington Square Health Foundation enabled the Shanti National Training Institute (SNTI) to introduce and test its model of volunteer training and management in Chicago. Shanti of San Francisco is best known nationally for its successful training of more than 8,000 volunteers to help people with HIV/AIDS, but more and more non-HIV service providers were turning to it for advice on using volunteers to assist other people with diminished abilities or chronic illnesses, particularly the elderly. Service providers and family members alone are unable to provide the assistance currently needed by some 1.6 million people over age 65, much less assist an estimated 2.1 million people by the end of 2001. A properly prepared workforce of volunteers will be needed in every major urban area to provide adequate and affordable assistance to special populations. 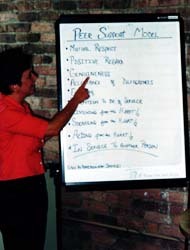 Toward that end, in Chicago, as part of the Washington Square Health Foundation grant, Shanti National Training Institute held a workshop in January 2000 for 11 participants representing nine Chicago service providers, including four providers whose overall mission is to serve the elderly. Participants reported that the workshop enabled them to enhance in some way volunteer programs when they returned to their agencies. The Council for Jewish Elderly, after participating in the workshop, requested that Shanti conduct training for agency staff in developing strategies for working effectively with volunteers. Other agencies also availed themselves of the follow-up technical assistance provided by Shanti and reportedly introduced one or another enhancement. In addition to helpful relation-ships established with Shanti, the participants were inspired to renew or establish working relationships with other participating providers. Finally, the workshop set the stage for a partnership between Shanti and Chicago’s Little Brothers – Friends of the Elderly, which will assure Chicago a public forum on volunteers, and provide volunteer-dependent agencies a continuing source of strategies for the recruitment, training and retention of volunteers. This grant is an example of fostering collaborative activities of agencies to pro-vide cost-effective services. The program also builds upon lessons learned from grants, projects and service activities involving HIV/AIDS supportive services, an area in which Washington Square was and is a Chicagoland and national leader. The need for a more rational and replicable method of training and managing volunteers readily became apparent to the Foundation during its initial HIV/AIDS “volunteer” grants. We are pleased that these lessons are now being applied by Shanti in the Chicagoland area to bring needed volunteer services to senior citizens, many of whom have chronic diseases and are medically and financially indigent.